Jan Glozik was born in 1957 Born in Kovacica, Serbia. He began his artistic career in 1975. 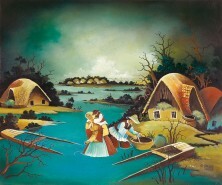 In 1989 he was admitted to the Kovacica Naïve Art Council and in 2000 he became its president.